What is Terracotta and why is it so good for garden pots? The answer is simple. 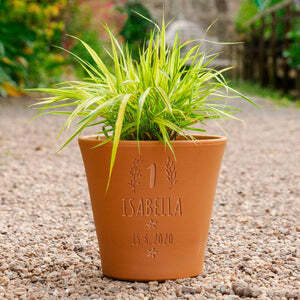 Terracotta pots create perfect growing conditions for plants both indoor and out. The terracotta clay is porous, allowing the plant roots to “breathe”. Our engraved terracotta garden pots are a great gift idea for gardeners and come in all shapes and sizes - just like gardeneners!